We got dropped off at the base of the mountain because parking was at a premium. Although it was a Friday, it was the holidays, so we certainly weren’t the only people who had the brilliant idea to visit Camelback. I left the beautiful epicurean to hike up with her camera in hand, and I took off at a decent pace. I was somewhat slowed by the crowds but made my way politely around people and most folks even stepped aside to let me pass, which was great. After a few minutes, I hit the first major ascent, complete with handrail, and I knew this would be no simple hill run. I pulled myself up the slick rocks and continued on up. It wasn’t long before I hit steeper and steeper portions and felt like I was on a giant angled stair-stepper at times. There were enough sections that required me to use my hands to pull myself up that I wished I had worn some cycling gloves for better grip (I’m sure they make gloves for climbing too, but there aren’t a lot of climbing opportunities in Iowa!). My heart rate stayed consistently high, but I kept my breathing in check. I spent most of the way up pushing myself and keeping my eyes on the rocks below me, so I wasn’t taking in the gorgeous views around me. I intended to take in the views at the top and then enjoy the trek down, which worked out well. After about 28 minutes, 1.1 miles, and 1300 feet of elevation, I made it to the top. The view took my breath away! 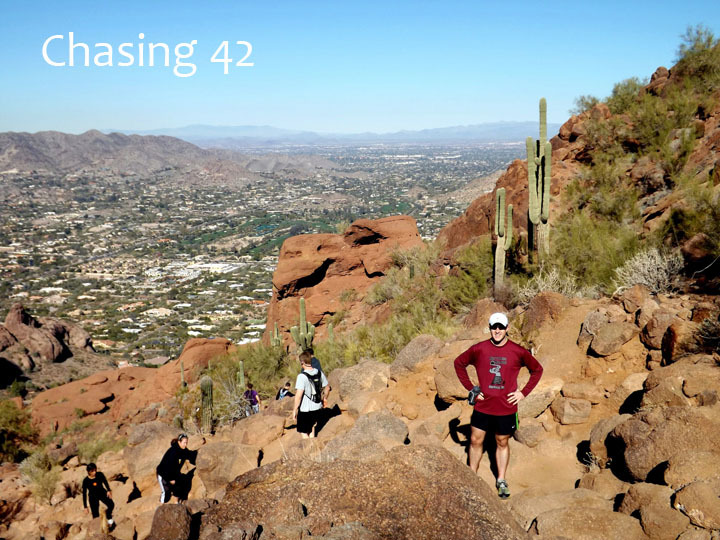 This was my first trip to Arizona and my first run up anything bigger than the various hills I had encountered at home and on my travels. I’m sure that after living in a place like Phoenix for long enough, the views might lose a little of their luster, but I was in total awe. From the moment I took in all 360 degrees of beauty, all I could think about was wanting to do it again! 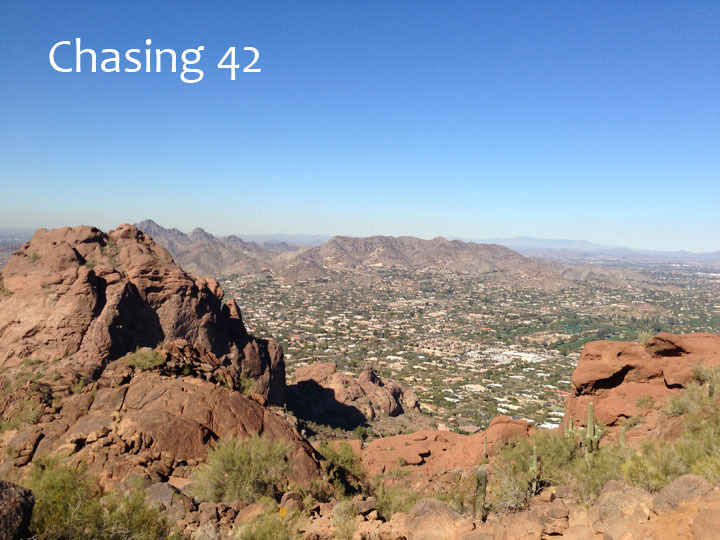 I wanted to find every trail in Arizona and run it. I wanted to visit the Grand Canyon and run Rim to Rim (to Rim). The feeling at the top of Camelback was more energizing than any nutrition bar. Once I had taken enough pictures to satisfy my needs, I started out back down. I met the epicurean a bit below summit and we trekked down together. It was a beautiful day, a great run, and a wonderful way to cap off an enjoyable trip. As it turns out, they are going to be closing the Echo Canyon Trail later this month for upgrades, and it won’t reopen until the fall so I’m really glad we got to experience it while we were there. I can’t wait to get back! Great photos. This is one to add to the list. The whole area begs for running and hiking…its well worth it!